Are You Making These Skincare Mistakes That Are Damaging Your Face ? These skincare mistakes can easily be avoided as they often damage your face and body. Some of them are so surprising because all our lives we have been doing it the wrong way and nobody said anything to us. Be it using cotton pillowcases, over scrubbing our faces or using hot water. Some are very obvious but then the lazy us tend to not apply it in real life like putting on sunscreen every day, popping those pimples etc. Let's go through the mistakes one by one this time. You want to buff up your skin, clean it properly and remove all that gunk. It feels good initially but slowly and steadily you strip off that top skin layer which is actually a protective barrier. Once it is removed, your skin is exposed to environmental toxins and sun damage, causing ageing. So, first off, buy a good face scrub with soft beads and not those abrasive ones and use it to exfoliate two to three times a week. Once or twice it is okay but it is a crime to your skin if you have been sleeping with your make-up on. This cannot become a habit! Why do we ask you to do that? Well, makeup clogs our pores and eventually, they become larger. Once your collagen levels decline, the pores will not get back to what they were initially. You make me removing your make-up properly but then you are also supposed to cleanse your face with the right cleanser. Buy a cleanser which has antioxidants for protection, salicylic acid to help clear your pores, and witch hazel, which acts as a natural astringent. Switch to silk or satin Today! Why? Satin or silk minimises permanent creases and complexion issues. When we press our face to the pillowcase it causes trauma to the skin. Over time, this trauma can cause permanent creases as our collagen breaks down. This is where satin comes in. It lets your face sink in, unlike cotton. This should be your thumb rule! You have to, I repeat, Have To apply sunscreen every time you step out of your house even if it is cloudy. Look for one that has an SPF of 30 or higher. Buy the kind which helps in shielding you from UVA rays (as well as UVB) which are known to cause photoaging of the skin. Most of us know we shouldn’t do this, but lots of us do it anyway. 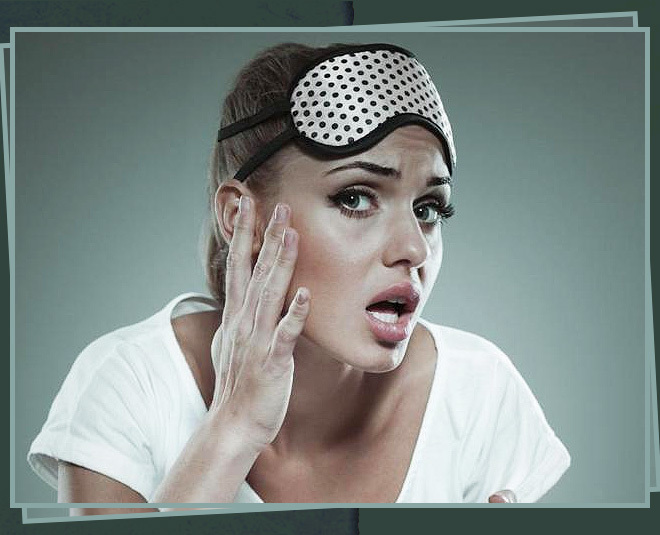 We rub our eyes a lot, pick on our skin a lot and this causes damage creating irritation, scars and wrinkles. Don't Miss: Try These DIY Potato Face Packs As Per Skin Type! Said by so many makeup artists. Clean your make-up brushes every day. You use it on your face directly. It does not just soak in the product but also the outside bacteria! Just like over-scrubbing, if you overuse your cleanser or products with retinol in them, that too damages your skin. It isn’t necessary to cleanse in the morning and the evening. You should concentrate on the evening cleanse which happens once you are home from pollution and all. Remove the dirt, oil, sweat etc in one go. What is recommended is that you buff your skin with a wet cotton washcloth in the morning instead of another round of cleanser. Quit doing that to your skin! It looks so bad and is so unhygienic! When a dermatologist drains a pimple they apply downward pressure, but when you and I do it, we squeeze from the side which ends up backfiring because it causes infection to go down deeper into the pore. If you do not touch it, it will go on its own. I am guilty of this one as I hate tying up my hair. The hair tie annoys but then it is said that this causes hair fall. But what we can do is, make a braid and use a thin rubber band rather than a scrunchie maybe?! Pillowcases accumulate a buildup of things like conditioner and scalp oil that can clog your pores on your face over time. Change the casing and your sheets every week! It also becomes home to everyday bacteria. Now, do you want that in your hair? Don't Miss: Have You Started An Anti-Ageing Routine For Your Hands? Yes Yes, we all are guilty of this. But have you ever realised how our grandparents and parents are healthier than any of us? What we can do is start having healthy salads. Add bell pepper o it and yes green leafy vegetables are a must. Your salad should look colourful. That is when it will have all the nutrients. Keep your skin hydrated by using the right kind of moisturiser. Regardless of your skin type, it’s important that you moisturise daily and apply a heavier cream at night. Less is more. Do not put a lot on your skin. Use lightweight serums, a toner is good. It feels amazing but it dries up our skin badly. I have personally experienced it. It even ages your skin! Hot showers strip your skin of essential moisture and healthy oils. I recommend taking warm, not hot showers.